This issue’s article is “Fifth Power of Two-Digit numbers” by Sanjay Dixit. Sanjay is a VM enthusiast from India who loves practising VM and exploring new areas. 1) Teacher Training Course – 9 weeks. 2) Certificate Course – now a 3-week course – the trainer for this course is Dr Arvind Prasad of Queensland University. 3) The Crowning Gem (this is a new course) – 4 weeks. Also, the next Diploma course will start on 28th January (follows on from the Certificate course). And in May/June we hope to offer another new course: on Applied Mathematics. Yesterday [29th November] at Torakina Beach, Australia, in glorious sunshine we held our 2014 Pebble Maths end of year certificate presentation ceremony. Each child received a well-earned award and a Pebble Maths pen. Everyone has achieved amazingly this year and deserved the accolade that they were given. Congratulations everybody! And a big thank you to the parents and grandparents for their incredible support. Preparation for High School Workshop. This workshop is primarily for children who will be entering high school in 2015 to ensure that their foundation in numeracy and basic geometry is solid. Here's a quick shortcut for multiplying numbers by 9. For AB x 9, subtract A + 1, then append 10-B. For example, with 68 x 9, simply do 68 - 7 = 61, then append 10 - 8 = 2 to get 612. For 94 x 9, you merge 94 - 10 = 84 with 10 - 4 = 6 to obtain 846. The underlying algebra is that for a given number 10A + B, with 0 < B <9, we are computing 10[(10A + B) - (A + 1)] + (10 - B) = 90A + 9B = 9(10A + B). 123 x 9, 123 - 13 = 110 is merged with 10 - 3 = 7 to get 1107. A similar approach can be taken when multiplying by 99. For AB x 99, subtract A+1 from 10 times AB, and then append 10 - B. For example, with 87 x 99, simply do 870 - 9 = 861, and then append 10 - 7 = 3 to get 8613. For 37 x 99, you merge 370 - 4 = 366 with 10 - 7 = 3 to obtain 3663. The underlying algebra is that for a given number 10A + B, with 0 < B <9, we are computing 10[10(10A + B) - (A + 1)] + (10 - B) = 990A + 99B = 99(10A + B). And finally, for multiplying with 999, for AB x 999, subtract A+1 from 100 times AB, and then append 10 - B. For example, with 46 x 999, simply do 4600 - 5 = 4595, and then append 10 - 6 = 4 to get 45954. For 77 x 999, you merge 7700 - 8 = 7692 with 10 - 7 = 3 to obtain 76923. The underlying algebra is that for a given number 10A + B, with 0 < B <9, we are computing 10[100(10A + B) - (A + 1)] + (10 - B) = 9990A + 999B = 999(10A +B). PLANNING FOR THE 2015 CELEBRATIONS? Please keep us informed of events you are planning to mark this anniversary so that we can let everyone know. 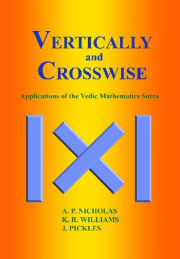 Swami Thirthaji in his Vedic Mathematics book (Chapter 32 Elementary Squaring page 289) explained briefly how to find fourth power of a number. It is possible to extend the application of binomial theorem to find fifth power of a number. Let us see how we can find fifth power of a two digit number. E.g. 21. We will compute from right to left. 1. Find ratio of two digits. Left digit divided by right digit. Here it is 2 divided by 1. 3. We need to know the fifth power of right digit. Here it is one. This will occupy right most part. 4. Multiply each preceding part by ratio starting from fifth part (Anurupyena sutra). 5. Multiply each part by its corresponding coefficient as per above binomial expansion. 6. Keep only one digit in each part and carry over extra digits to left. If the right digit is greater than 5 then it can be converted to its vinculum form. Let’s find fifth power of 28. Its vinculum form is 32 in which you have to imagine there is a bar over the 2 to show it is negative. Here ratio will be 3 divided by (-2). After getting answer in vinculum form, convert it to normal form.